Obviously its feel so good when you get everything in one stroller to make your baby ride safe & fun. 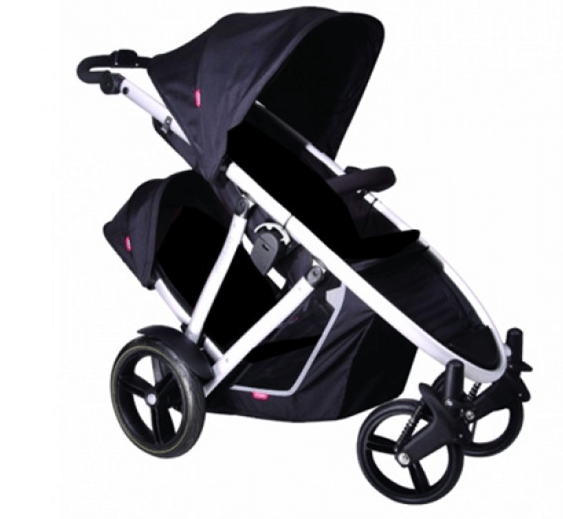 “Phil & Teds Verve Stroller Review ” is a complete luxuries stroller with double seat option, all terrain wheels, floating canopy & many more. It can accommodate infants to toddlers with 7 seat combinations. So let’s discuss more about it in “Phil & teds Verve Stroller reviews”. It rolls on four wheels with two hard rubber 10″ front wheels and two air-filled 12″ rear wheels. The front wheels are swivel with the ability to lock straight for more stability. These tires will handle any terrain with no problem. There front wheel suspension absorbs bumps & provide a smooth ride. 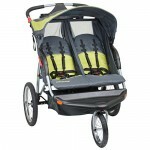 The medium size floating canopy helps to protect from sun, the canopy slides up and down the frame up to 33″. There is no peek-a-boo window inbuilt for air circulation or for transparency between you & you child but as an option you can use one included plastic or mesh piece cover to protect your child from harsh weather by covering up over the frame. The seat is 14″ wide with 25″ seat back and 29″ from the bottom of the seat to the top of the canopy. The seat can accommodate a child from birth and up to 44 lbs. With the help of the strap system you can recline the seat in a multiple way according to your baby comfort. 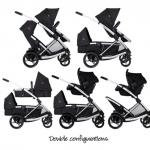 There 7 seat combinations, for single seat: child in a main seat, cocoon carrycot in the main seat, bassinet instead of the main seat, travel system with a car seat. For double seat: second seat up front, second seat in the back, travel system with the second seat in the back. This second seat is 14″ wide with 19″ seat back. It has 3 recline position. It cannot accommodate two new born in double mode because the second seat does not have a flat recline. The 2nd seat has a holding capacity up to 44 lbs. The handle bar goes from 29″ up to 42″ from the ground, but it doesn’t have telescoping handle for more room. 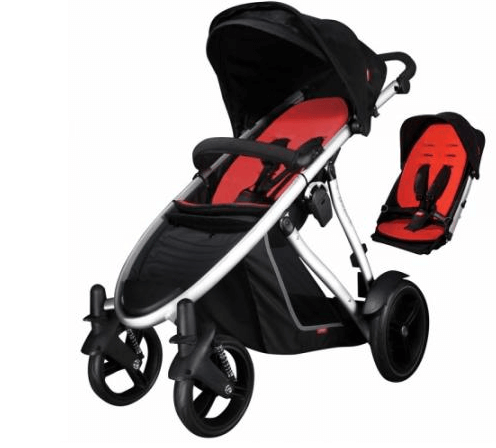 It has a red button in the middle of the handle bar that will lock both of the rear wheels in place which is very easy to use & safe but there is no foot brake like other strollers. It has adjustable padded 5 point harness with buckle to lock & unlock to provide safety to your child. 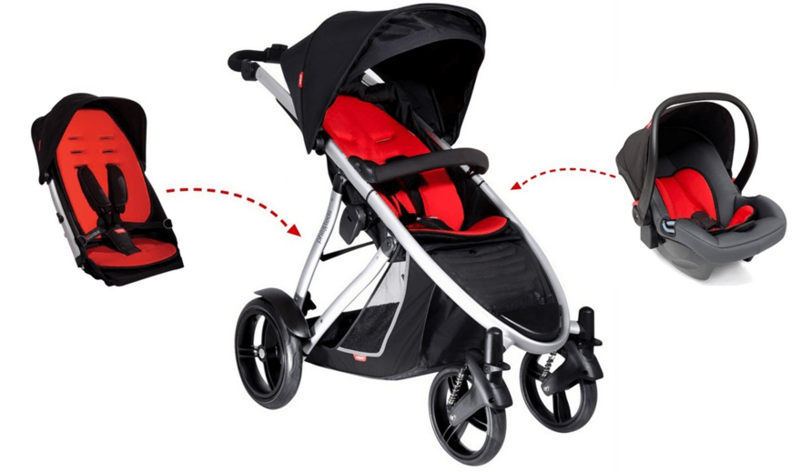 It has a padded removable bumper bar which is not a swing away bumper bar & this thing you may not like in “Phil & teds Verve Stroller reviews”. With the help of both the hands you can first, lock the front wheels and brings the canopy all the way back. Next, lift two levers located on both sides of the frame and fold the stroller in half. It has standing & compact fold with automatic lock systems. 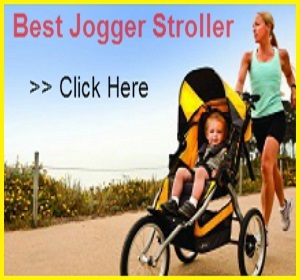 Read More – Best Side By Side Strollers For Twins . We can’t miss this part while going through “Phil & teds Verve Stroller reviews”. It has large basket to put diaper bags & your shopping stuffs but unfortunately when you attach the second seat then your child’s legs will be in the basket so there will not be any room. There are no other included accessories for storage like for your small stuffs or drinks etc. 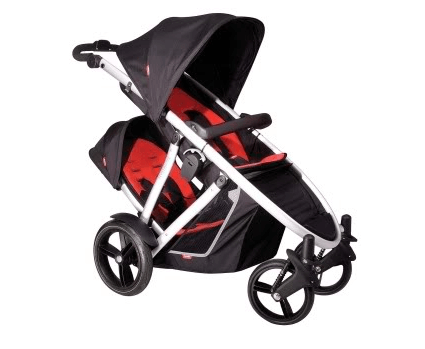 Read More – Best Lightweight Umbrella Stroller For Vacations ..
Phil & teds Verve Stroller is available only in two colors: black and red. 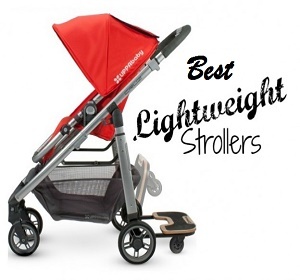 All strollers come with a sleek elliptical aluminum frame. The seats are soft foam padded with chemical free fabric for the safety of your child. 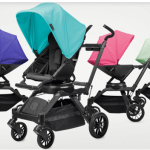 After the long discussion I can give a positive look towards this “Phil & teds Verve Stroller reviews”. 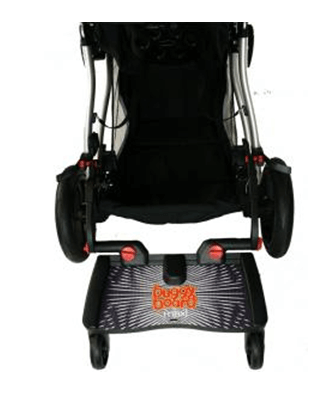 Because of the luxuries features, convenient seat recline position & combination this is a best stroller you can have. 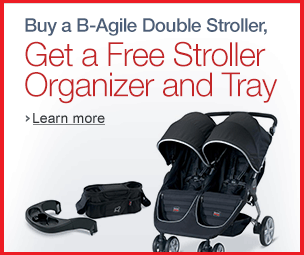 With 1-year warranty from the original date of purchase a durable & safe stroller to make your baby ride happy & smooth. So of your are a parent who love to travel in different area & want carry your both child with you even in the city walk , so don’t think much just go for it. It’s worth buying.